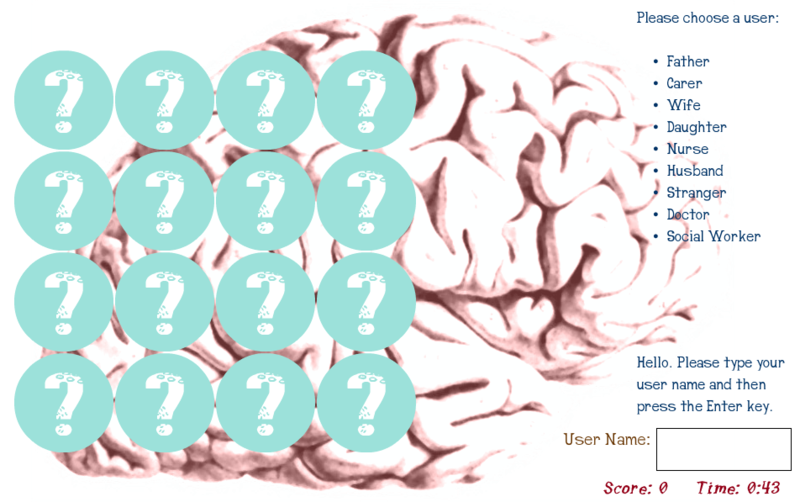 Rememori is a degenerative memory game created in Flash. It’s poetics play out some of the affects and effects of dementia on an intimate circle of characters. Juggling with point-of-view and the process of identification, the Rememori player becomes entangled in a struggle for accurate recall, orientation, attention and the search for meaning. In such situations, where does empathy lie and how does the player cope? Inevitably, it’s a contrary game - there can be no winners. According to the Alzheimer’s Research Trust, 42% of the UK population (25 million people) know a family member or close friend with dementia, and worldwide, there is a new case of dementia every seven seconds. * In the light of these facts Rememori is a challenging game in more ways than one.